Are you a news junkie? Then Bundle might be your next favorite app. 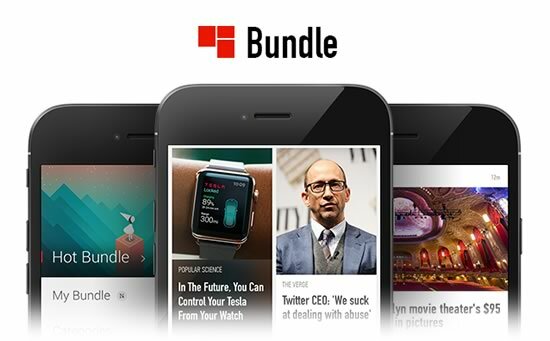 Bundle is one of the latest personalised mobile news app to keep up with the content from the most popular news sources around the world. It offers you a number of great features and sections (Hot Bundle, Live Bundle, Photography and etc) along with its sleek design and easy-to-use interface. But what I like the most about Bundle is: You can make your own list of your favourite sources AND you can explore through the categories and Hot Bundle where Bundle’s editors handpick content and sources for you. So you don’t get stuck with the sources you already follow, you get to discover new stuff everyday. Additionally, Bundle offers a bunch of location preferences so that you can change your news feed accordingly with the location you choose. (US, UK, Japan, France, Germany…) Also, it comes with 6 different languages including German, Spanish, French and so on. Final word: Whether you’re in a rush and have a limited time to get today’s news or have hours to spend reading great articles, Bundle offers you both!